There are some places we have to visit every time we visit New York. Los Angeles has amazing vegan food, but there are some things we don’t have here on the west coast. 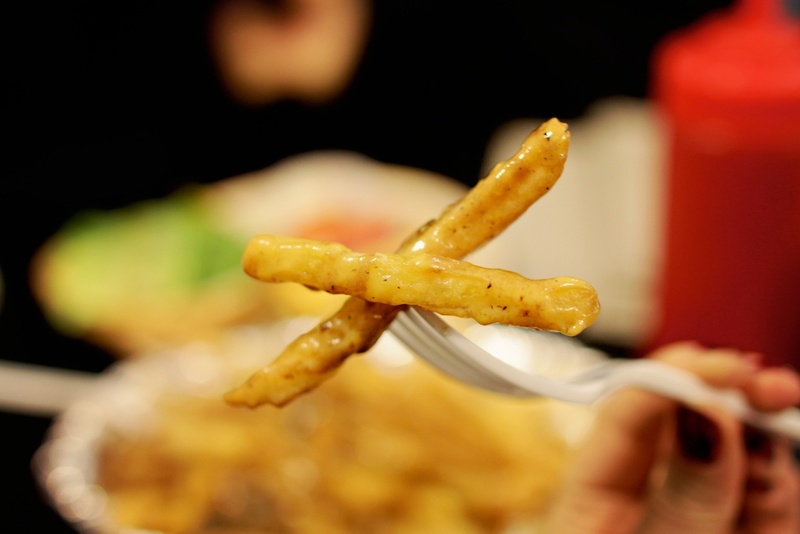 For one, we always go to Foodswings for some DISCO FRIES. You know what I’m talking about. Fries + gravy + cheesy sauce. They are so good. While places out here have tried to replicate their deliciousness, none of them measure up. A new favorite of ours is Champs. We visited there for brunch and oh my god they have vegan monte cristo. 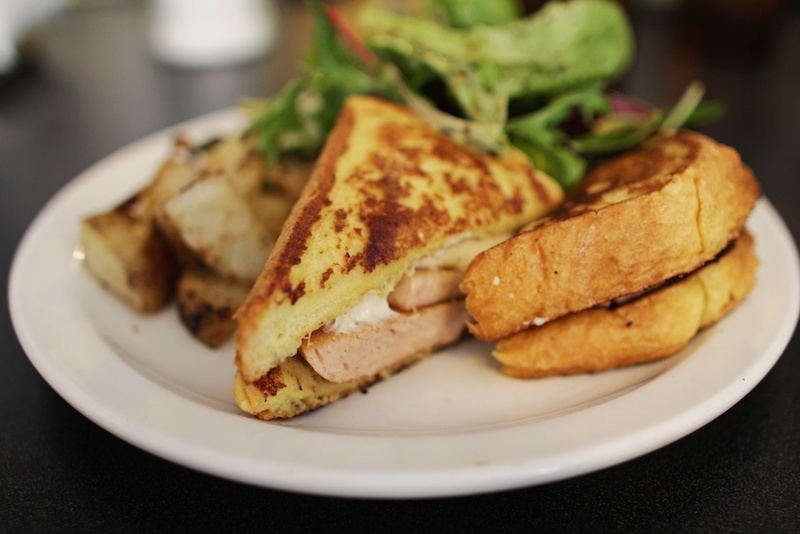 A faux ham and cheese sandwich made with french toast. Dream come true. The thing I miss the most out here is Vegan Treats. Officially the bakery is in Bethlehem, Pennsylvania, but it’s available at nearly every veg restaurant in New York. The most decadent cakes and pastries you’ve ever had and the cutest decorations too. 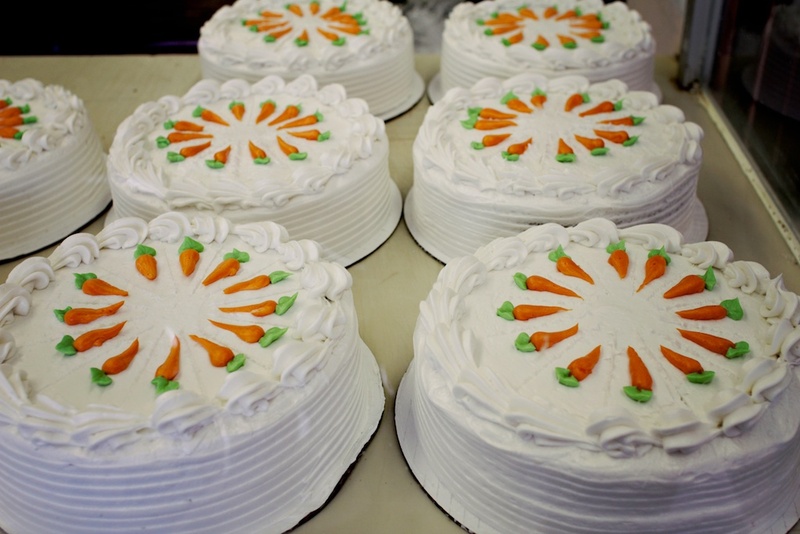 Look at those carrot cakes! No one makes a better donut. You have to know when the deliveries are to get these, they sell out fast. We also tried Blossom for the first time. These raviolis were amazing. 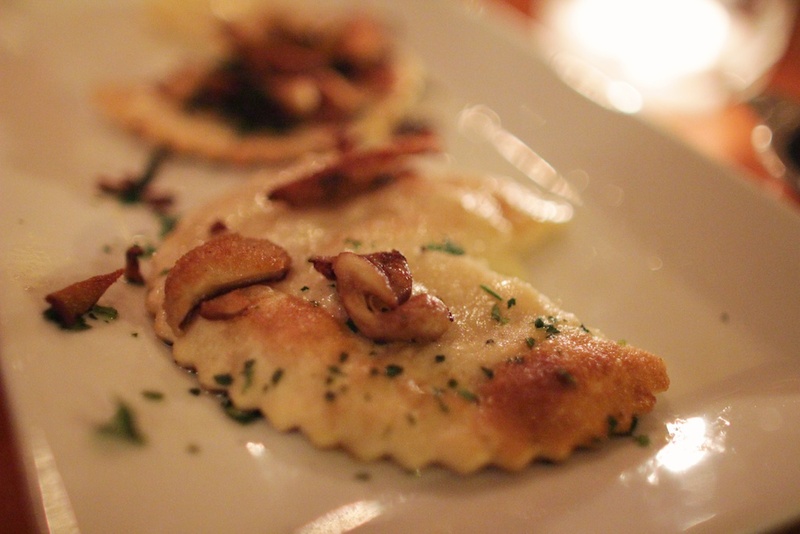 Perhaps I am biased because I love ravioli, but these were by far some of the best. We stopped by Blossom in a rain storm right before going to see Margaret on one of it’s few theatrical runs. You should definitely see this movie. It’s crazy but really good. I’m really glad we were able to see it in New York too, since it is really about the city in a way. What are your favorite places to eat in New York? One day I want to go of a dedicated food tour of the city. Those doughnuts look so delicious. And the ravioli! Oh my. I’ve never heard of any of those restaurants, but will certainly check them out on my next trip to NYC. My favorite restaurant was Dhaba, an Indian restaurant – it was authentic, ridiculously spicy and so delicious. And my other favorite was Free Foods. They had a lot of raw offerings, which I loved. And their macaroons were to die for. Sacred Chow, Soy & Sake, and, of course, Lula’s Sweet Apothecary: all not to be missed. Oh my gosh, I can’t believe I left out Lula’s. Best ice cream sundae I’ve ever had. Wow, thanks! I’m going to visit my sister’s family in New York in a couple weeks. 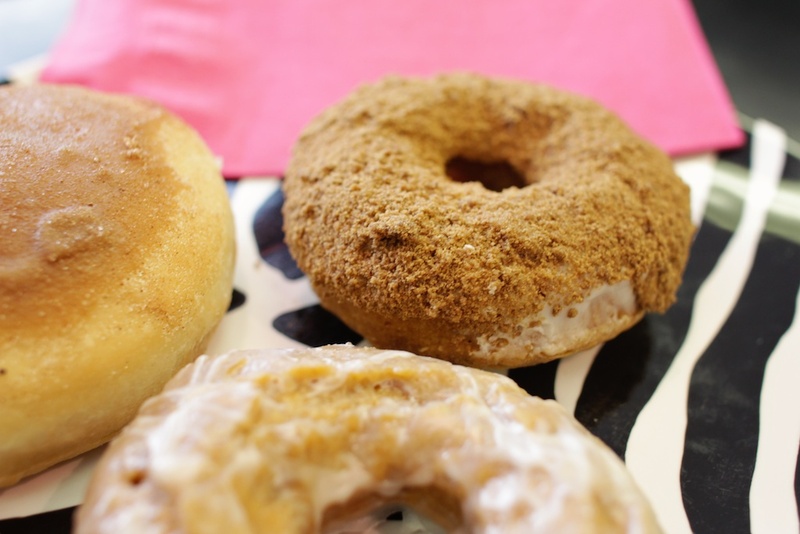 I don’t know how many restaurants I’ll get to but I want to try that new doughnut place, Dun-Well. Nick, you won’t be far from Pine Box Rock Shop; add them to your list! My favorite vegan places in NYC are Sacred Chow, Blossom (the one on the Upper West Side, not the one in Chelsea…there’s another one opening in the West Village! ), Curly’s (though it’s now called 14 Carrots—ugh—and I’m not sure if the menu has changed), and Atlas Cafe (not vegan, but LOTS AND LOTS of vegan options). Atlas is awesome. The best place to get vegan treats and they have crepes which makes me insanely happy. I loved Curly’s. I hope the menu hasn’t changed. We went to Caravan of Dreams once and it was surprisingly good. I definitely liked the atmosphere and healthier but still delicious menu. You do totally need to visit Foodswings & Champs. Absolutely worth the trip. I have only been to New York once, but when I was there I had the amazing chance to visit Lula’s as well, it was absolutely incredible. I’d say it was the best sunday I had ever had, including non-vegan of course. My friends and I also built and obsession for Terri’s, probably because it was about a block away from our hotel. We were also able to visit a gourmet Korean restaurant, I believe it was called HanGawi. It was my first time going to an Asian restaurant that had the tables where your feet are below the floor (if that makes sense). The food was incredible, I would definitely recommend it! Shawn has told me about HanGawi and I’ve always wanted to go, we just haven’t had the chance. I really want to try it. It sounds amazing. Hangawi is awesome; highly recommend over their sister restaurant, Franchia. Lan Cafe is a little hole in the wall on E. 6th St. not too far from Lula’s. Cheap and so awesome. We also go to Soy and Sake a lot because it is great the fishtank entertains our kids and we can eat in peace. Boneshakers. Pukk has vegan stuff and is really cheap. Candle 79. Zen Vegetarian. I would eat there every day! All of this looks amazingly delicious! I want to try ALL of these places next time we’re in NYC!